Coastal Carolina University is accepting applications for a Volunteer Monitoring Coordinator in the Burroughs and Chapin Center for Marine and Wetland Studies’ Environmental Quality Laboratory. This facility conducts research and monitoring in the coastal and inland waters of northeastern South Carolina. This position is an annual appointment with benefits. Duties will include, but are not limited to: training and supervising others, including students and volunteer monitors in proper sampling and analysis procedures; development of training materials and new procedures; maintaining and calibrating volunteer monitoring equipment; maintaining supply and equipment inventories, data management, report generation, and other record-keeping activities associated with QA/QC; assisting with updates of volunteer monitoring Quality Assurance Project Plans, SOPs and datasheets; performing sampling duties to fill in for absent volunteers; performing outreach activities associated with the volunteer monitoring programs; and performing field and laboratory analyses of environmental samples for other projects in the Waccamaw Watershed Academy and Environmental Quality Lab. Qualifications required: Bachelor’s degree in science (e.g. chemistry, biology, marine science, geology, environmental science) and one (1) year of related job experience. Must maintain a valid SC driver’s license. A successful candidate must possess strong field, laboratory and computer skills; must possess excellent laboratory technique and good attention to detail; and must be a strong swimmer. Additionally, a successful candidate must comply with the EQL’s standard operating procedures and quality control practices; and be proficient with Microsoft Word and Excel. To read more about the Waccamaw Watershed Academy and the Environmental Quality Lab see: https://www.coastal.edu/wwa/and www.coastal.edu/eql/. Interested applicants should apply on-line at http://jobs.coastal.edu or apply on-line in the Office of Human Resources and Equal Opportunity between the hours of 8:00 a.m. and 5:00 p.m., Monday through Friday. Applicants should submit a cover letter, resume and the names and contact information for three (3) professional references. If selected, the selectee will be required to provide official college transcripts to verify educational qualifications. Review of applications will begin immediately and continue until position filled. Please donate through our new Services website. Your generous donations fund travel awards to help student members attend SEERS and CERF meetings (unless you designate an alternate use for your gift). SEERS is a 501(c)(3) nonprofit educational organization. SEERS annual dues now secure your membership for the 12-month period after joining rather than the calendar year. We encourage all of our members to stay involved by renewing their memberships. Thank you for your continuing support! Need to make a payment to SEERS? You may use the PayPal button below, using a credit card or your PayPal account, and note the purpose of the payment in the memo box. If you would prefer to send a check, mail to the Treasurer and please describe the purpose of the payment. Thank you. 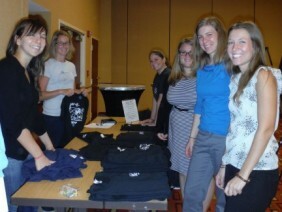 Long & short sleeve Ts are sold at our regional meetings. Proceeds from sales fund student travel. Can't wait until the next meeting? Contact the student representative for orders between meetings. SEERS is an affiliate society of the Coastal and Estuarine Research Federation (CERF). We encourage you to join and support CERF. CERF members receive great benefits, including access to an international job board and tools for early career scientists to become leaders in their fields. Join or renew your CERF membership today! Copyright © 2019 SEERS. Powered by WordPress. Theme: Spacious by ThemeGrill.